Dr. Mark Skousen – Heather Wagenhals Helps Unlock Your Wealth Today! 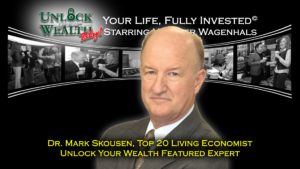 Dr. Mark Skousen, one of the world’s Top 20 living Economists Joins Unlock Your Wealth Today Starring Heather Wagenhals Featured Experts LineUp in Season 2. MARK SKOUSEN is a financial advisor, former CIA analyst, university professor, and author of more than 25 books. Recently named one of the World’s Top 20 Living Economists, Dr. Skousen has been helping investors like you and me make money for almost 40 years through his flagship publication Forecasts & Strategies. You only last that long if you deliver profits, year after year. Mark also edits TNT Trader, Five Star Trader, High-Income Alert, and Fast Money Alert.